Browse our selection of complete CCTV systems for your home and business. With these systems you can now track, monitor and even record guests and customer movements for added security and peace of mind. The 3.5-Inch Peephole Viewer with Auto Visitor Photo Recording allows you to record individuals who are standing outside the door without them knowing that they are being recorded. There’s a zoom-in function that can allow better recognition. 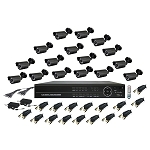 For business owners, the best investment comes in the form of 16CH H.264 DVR Kit that comes complete with 16 pieces of 16 ft cable and 16 pieces Zoom IR camera. The cameras can be scattered around the establishment or a large commercial complex. An 8-channel version is also available. 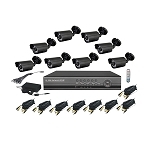 Cameras and CCTV systems are safe and cost-effective solutions for home and business security. When properly installed in strategic places, these can help secure your property and everyone’s safety even if you are not always around.